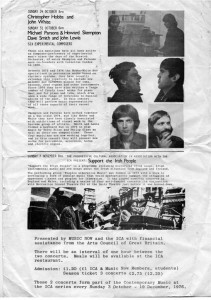 Here is a (rather battered) flyer advertising a series from 1976 sponsored by Music Now (an organisation created by Victor Shonfield to promote experimental music and jazz in Britain). The first two concerts advertised here present six British systems composers in the duo line-ups they had at the time. Christopher Hobbs and John White were more commonly known at this time as the Hobbs-White Duo. Arguably, John White was the originator of British systems techniques; at this point Hobbs and White had abandoned ‘strict’ systems for percussion (as the material says here — click to see it better), and were playing wind instruments and piano pieces of an increasingly through-composed, referential style. Hobbs and White have played together since, but this was one of the last concerts in an unbroken partnership that had been going since the late 1960s with the Promenade Theatre Orchestra. Michael Parsons and Howard Skempton have played together and toured as a duo since this concert. Parsons was, like Hobbs, White, and Gavin Bryars, closely associated with the Systems group of British artists. John Lewis and Dave Smith played American minimalism as well as their own work. Parsons wrote about these composers and this concert series in his article, ‘Systems in Art and Music’, The Musical Times, 117/1604 (1976), 815–818. 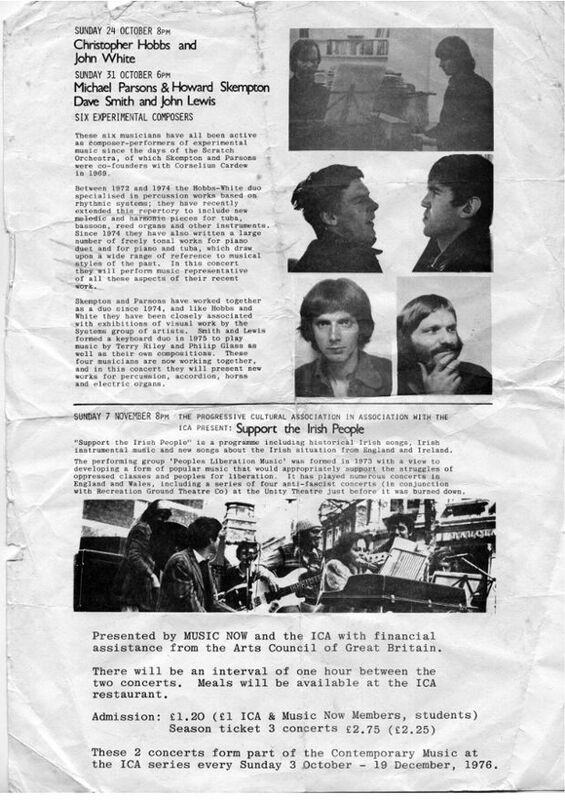 The other concert on this flyer advertises a concert promoted by the Progressive Cultural Association, featuring the Peoples’ Liberation Music group. Founded by John Tilbury, Laurie Baker and John Marciano, this folk-rock group is best known for the participation of Cornelius Cardew.